Like her gold counterpart, the American Silver Eagle is an exquisite piece of art. The coin was first issued in 1986, and is only minted in one ounce sizes. Also our most popular silver coin, the Silver Eagle is the official silver bullion coin of the United States and is minted at the San Francisco Mint and the West Point Mint. The coin's 99.9% purity is guaranteed by the US Mint, so you can feel confident in investing. The design is inspired by the beloved Walking Liberty half dollar, which is widely considered to be one of the most iconic designs for any US coin, and was originally created by the sculptor Adolph Alexander Weinman. On the obverse, you have Liberty in a finely detailed, flowing dress grasping a bundle of olive leaves with the US flag blowing gently behind her as she wraps it around herself. Her other arm is outstretched as she gracefully walks with the setting (or is it rising?) sun shining brilliantly behind her. On the reverse is a heraldic eagle behind a shield designed by John Mercanti. In the eagle's left talons are a bundle of arrows while the right talons grasp olive leaves under thirteen stars, which represent the historic thirteen colonies. The eagle is also clutching in its beak a ribbon inscribed with E Pluribis Unum, Latin for "out of many one" which is an homage to the motto on The Great Seal of the United States. The way the light catches this coin is amazing, and with its high silver purity that creates stunning reflections it is as much a pleasure to look at as it is a good investment. 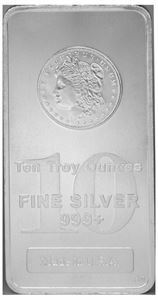 Silver American Eagle coins are available in a variety of quantities. 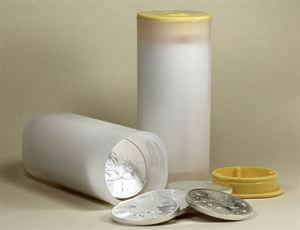 Get them individually, in tubes of 20, or if buying in bulk ask us about our monster boxes of 500. Quantity discounts are available.